Lilly w as found running loose chasing butterflies. 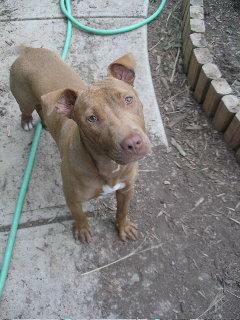 She is a beautiful fawn female approximately 18-24 months old and has received her first set of shots and is spayed. Lilly is a playful, sweet young dog that is very good with older children, but she has shown aggression towards other dogs and cats. Lilly has worked on her manners with a trainer and is very easily trained. She loves to curl up on your lap and have her belly rubbed where she eventually falls asleep. Lilly also loves car rides and hiking and is does wonderful on a leash. She is very good at fetching and retrieving her favorite toy and will play for a long time. 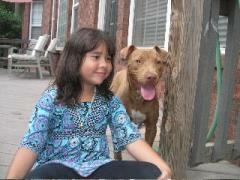 It is recommended that she has a home that is familiar with the Pit Bull breed and will have time to work with her. Lilly will need a forever home that will have time to play with her, give her the structure she needs, a fenced backyard with room to run, but most importantly a family that will love her forever.